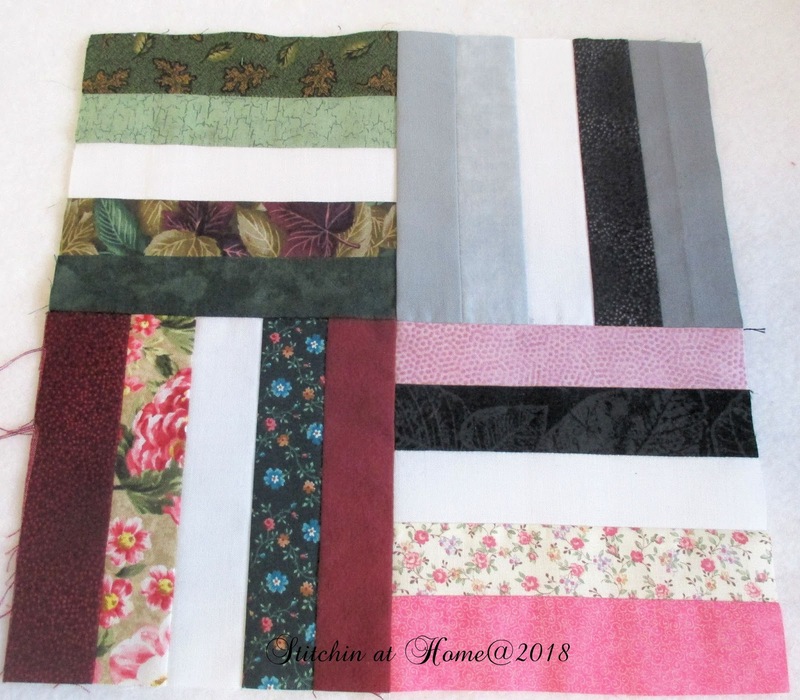 I am once again making a Hands2Help quilt hosted by Sarah of Confessions of a Fabric Addict. This is my third year participating and I will again be donating my finish to Ronald MacDonald House in London, Ontario. Last year I started making blocks using up some of my 1 1/2'' strings. You can read more about the blocks here. I would make a block or two now and then with no real plan in mind. 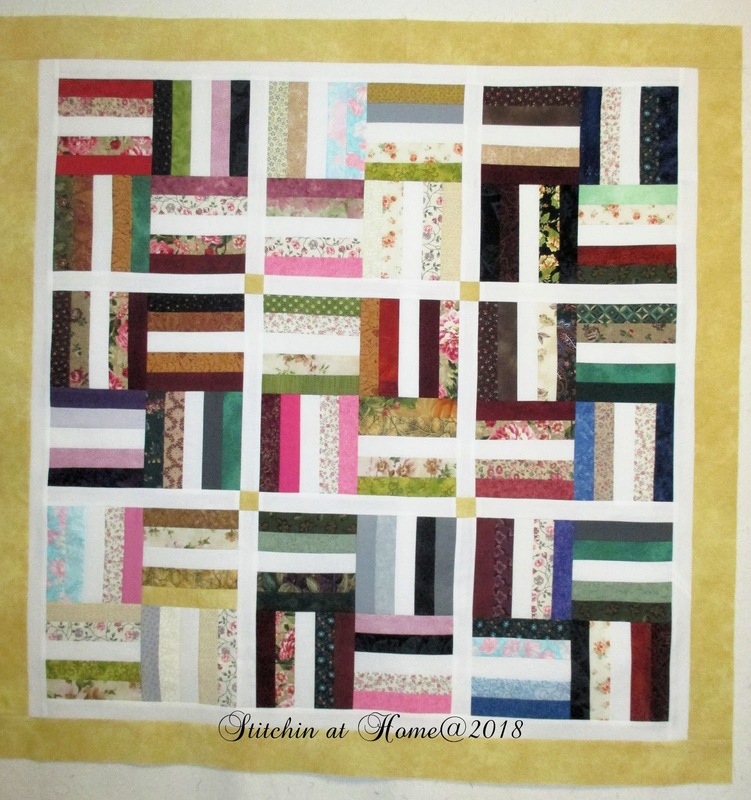 Come around to this years H2H which features scraps I knew I wanted those blocks to find a home and give a little one some comfort along the way. The blocks are 5 1/2'', a nice size to make into 4 patch blocks. I put them up on my design wall and played around with the layout and sashing. I was so into playing with these I completely forgot to take pictures. Does that ever happen to you? In keeping with the 1 1/2'' strips I used in making the blocks, I decided to go with 1 1/2'' sashing strips and inner border of white. The strips were left over from another project. It feels good to find a worthy home for them. The borders are 3 1/2'' bringing the quilt to a 40'' by 40'' size. Next up quilting and binding. I hope to have this finished up this week. I ALWAYS forget to take the pictures! Then I have to try to re-create something for a picture. It's so nice to use left-overs, isn't it? Nice finish. Oh, this is such a clever design! I love how the center white stripes are echoed by the sashing. So pretty! It is truly amazing what one can do with strips! I love this Cindy. 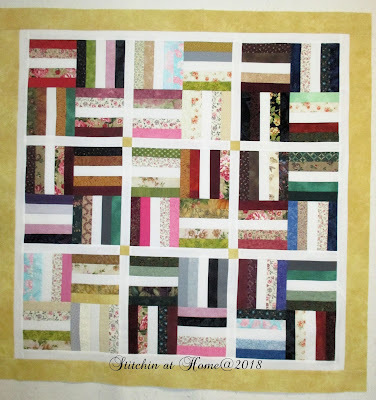 Putting in the cornerstones in your sashing is just the pop for this sweet quilt. It looks great, Cindy. I hope you have fun quilting it! I really like how the white strips play together! Great quilt.